Tuscan decorating is a combination of Spanish, French, and Italian styles. Casual and country, the Mediterranean decorating style is sure to please. Inspired by the hills of Italy, Tuscan style decorating is aged finishes, elegance (and yet rustic), often with terracotta tiles and textures on ceilings and walls. Iron wrought iron scrollwork, candle sconces and stone farmhouses are also highlights of tuscan inspired elements. If you like tuscan style decorating, then you will probably also like Southwestern style furniture and Southwestern porch designs. If you appreciate simplicity, a warm inviting atmosphere, nature and the country then you will love a Tuscany decorating style for your porch. 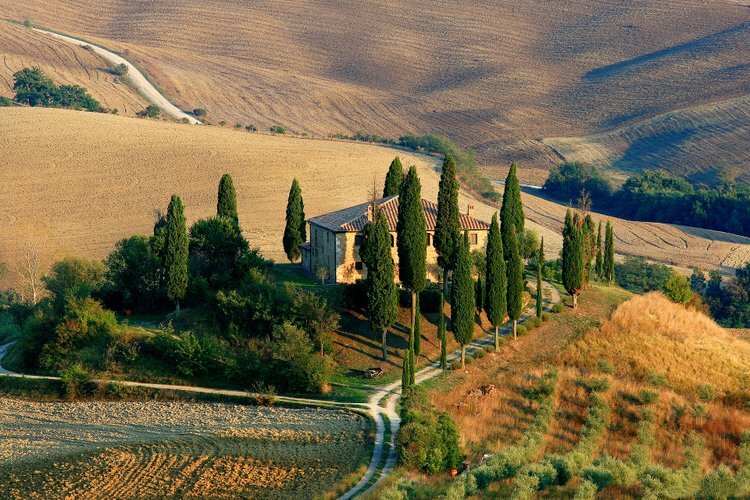 Tuscan, or Mediterranean architecture, is a blend of Italy, Spain, France, and parts of southern Europe. 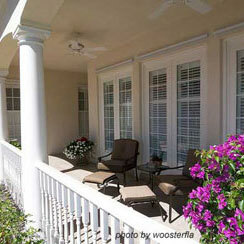 You can capture the true essence of Tuscan appeal right on your porch! Tuscan decorating will work exceedingly well in your home as well. Tuscan decorating is easy - go for a relaxed, comforting style. In our Guide to Easy Decorating Ideas we concentrate on four decorating factors: color, purpose, and focal point. The fourth factor is theme and we already know that- Tuscan! 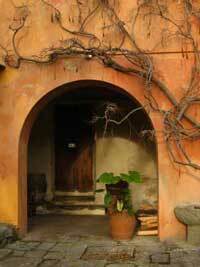 Tuscan (or Mediterranean) colors are ideally red, green, terra cotta, gold, brick, and blue. Use our handy architectural color guide to view these great color options. Red always makes a dramatic first impression so consider painting your front door a shade of red. Carry that color throughout your porch with a red urn or frame on artwork. 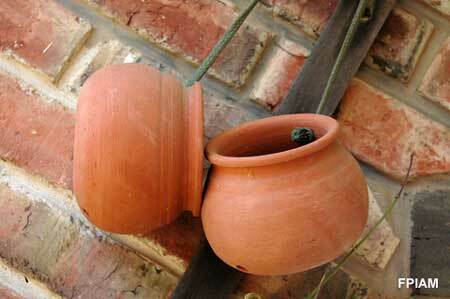 This works on any size porch but is great for small porches where every accessory counts. Don't overdo it - a splash here and there will do just fine. Consider a combination of red and gold or tan to give your red a softer look. 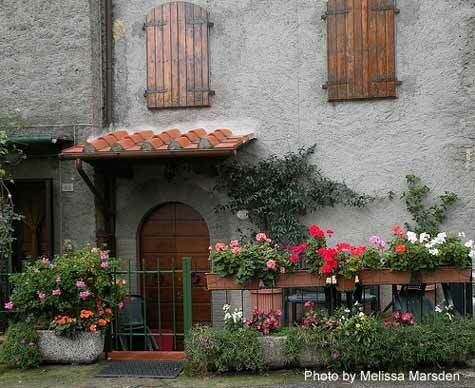 Tuscan colors should complement your natural surroundings. As you can see in the pictures above, terra cotta and brick tones connect to nature so incorporate them in columns, floors, and furniture. Use reds and greens with vegetation and ivories, yellows or tans with stone features. 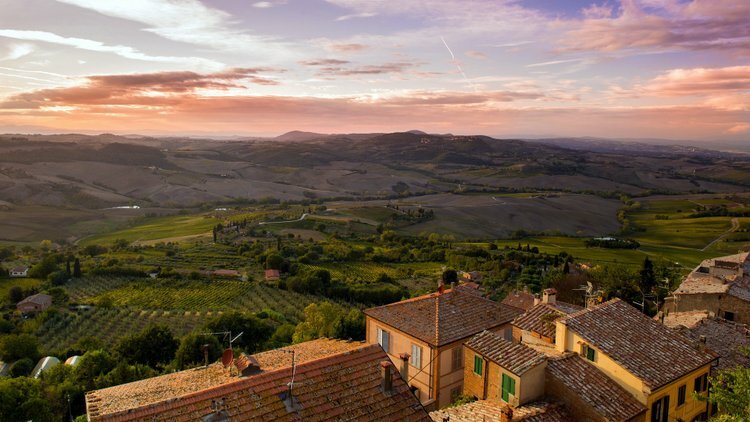 Because Tuscan decorating is based on nature, your main purpose could be, but not limited to, pure relaxation, intimate dining, privacy or a combination of all three! 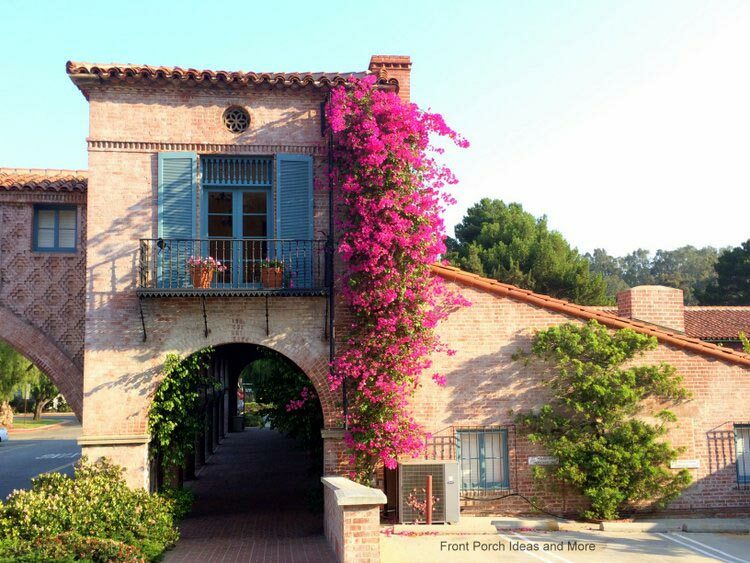 All lend themselves well to Tuscan decorating and all lend themselves well to porches! Select decorating items that complement your chosen purpose. Containers are a must for Tuscan appeal. Urns, ceramics, wrought iron, and terra cotta pottery are all classic Tuscan decorating materials and should be incorporated into your decorating scheme. 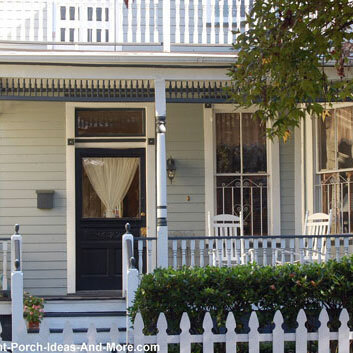 In addition, consider using wall tapestries or wrought iron wall grilles on your porch walls. Select wall coverings with colors we discussed above. For intimate dining whether for two or more, choose furniture in dark earth tones. You will find that many Mediterranean furniture pieces will have scrolled iron or carvings. For your table, cover it with a table runner in rich Mediterranean colors. Consider using a wrought iron candle holder centerpieces. If using wrought iron furniture, select cushions in complementary Tuscan colors. Keep furniture simple and clean, and look for pieces bearing the artful distressed finishes to give it an older look and perhaps charming look. Most common woods used are oak, cherry, and chestnut. If possible, do not use shiny or high gloss pieces. Rather choose furniture that will darken naturally over time. To give your porch real Tuscan appeal, use large exposed beams in the ceiling. You can either use solid beams (may require additional structural changes) or use faux beams. 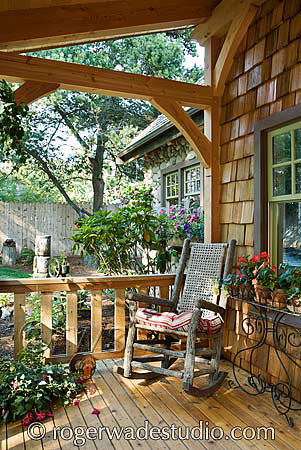 They are easy to install and look like solid beams giving your porch a real Tuscan flavor. 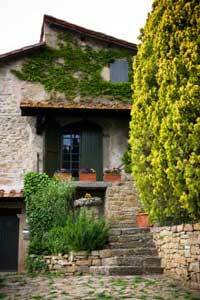 You can probably see by now that creating a focal point on a Tuscan porch is easy. You have many decorating items, from the table runner to beautiful terra cotta urns with which to create the focal point. You might also consider installing a water-accessory like a fountain (can use terra cotta for this also) on or near your porch. You can easily integrate a fountain in or around your porch landscaping. Here's an interior designer's trick we've learned - choose what they call an inspiration piece. 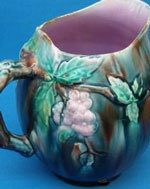 Because Tuscan decorating uses so many natural elements, one piece of Tuscan-style Majolica pottery may do the trick. 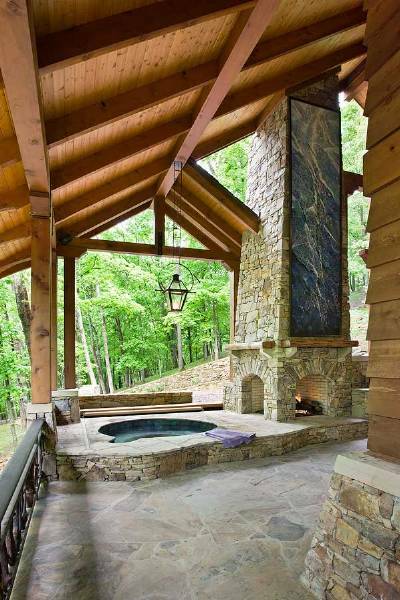 Use natural stone steps and walkways leading to your porch to enhance the Tuscan look. A popular material to use is cantera stone. This stone is carved by sculptors into columns, balustrades, door and window trim, and even flooring. It is available in various colors and shades and due to cost is a high-end item. 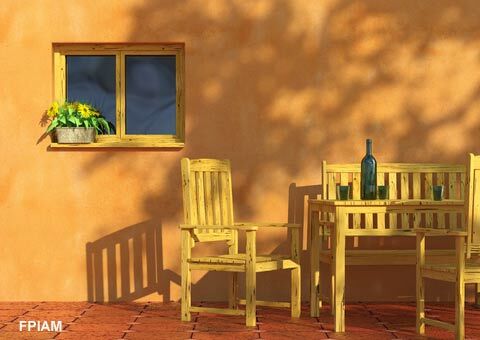 Get related ideas here: Southwestern furniture and Southwestern porch designs.